I just said that I was going to go "rest" and watch a movie with my dogs. After all, I am just barely a week out of "major surgery", even though laparoscopic, nonetheless, major anyway, as my Surgeon, Dr. Sullivan reminded me yesterday. I went in for my week recheck, knowing he would turn me loose to ride my exercise bike... Well, his answer was an emphatic NO! NOT for 6 WEEKS! And I realize he is right... if I did something stupid, and pulled what he has done loose, then the repair of that would be a much more difficult surgery, that would probably mean a hospital stay. I still can't fathom riding that stupid bike would hurt, but okay, I will behave for now. I am still sore, still purple from my navel, all the way down to my thighs... yes EVERY PIECE of me, is "purple". I won't give the "details" but you can get the jest of it all, since the hernia's are right at the pubic bone, and blood travels downward, when healing begins, thus due to gravity, several "parts" on me that are not usually purple sure are now. I had to laugh when I was telling him. He basically just came right out and said it, and I sat giggling and agreed ALL of me was bruised and purple! I am just so disgusted with everything right now, I won't even begin to get into all that has happened in just a few short days... but I will say between the ignorant people at my insurance company, and the stupidity of the "billers" at the hospital where I have my infusions, along with (if I get another automated stupid Call from Humana I am going to scream)!!! I want to say to that recording, QUIT spending MONEY on these stupid calls and pay my damned bills! Of course they see "coding" is wrong, but rather than question it, they just pay it wrong or right... and even if they "underpay" or believe me I had them overpay a year ago or so, and called to tell them they paid for blood and lab work that DID NOT belong to me... 4,000.00 worth! And honestly, I don't think they cared... But they sure as heck care when "their" premiums aren't paid.. I spent most of my walk in deep thought today. In fact my husband said I looked almost upset... but not really at all. I am more in this place that I have to "split" my time. I desperately have to go allow myself to work on my book, and post more of my "own" stuff here on my blog. Not that what I am doing is not awesome, because it is. But, more along the lines of I HAVE to for my OWN SANITY get back to writing my book. No more of this waxing and waning... or feeling fearful... it is time to put that "foot" in the door, and go for it. So, that is where my thoughts have been this afternoon. Actually this morning, I just about have the "mini-manual" and all of the "Hubs" and sites set up with the correct permissions and so forth. I just hope they will be able to decipher my manual. But, I HAVE GOT TO ORGANIZE and split my time up between my advocacy and my own blog and book. I have been so far out on a limb, with all of my new responsibilities with all of the Advocacy and Volunteer work (which I am THRILLED to do), but in between all of that, I've kind of lost my own "path" up the mountain to get my book written and published. Along with not overwhelming my blog, and FB page with too much of one thing, yet not nearly enough of "me"... which is why I do this... for YOU and for ME... so I have got to stick Rhia back into the picture as of exactly who I am, and not lose all contact of what my very real goal is... to write that book, and to have the very best blog I can. May be would should have named this Hell 2014!!!! 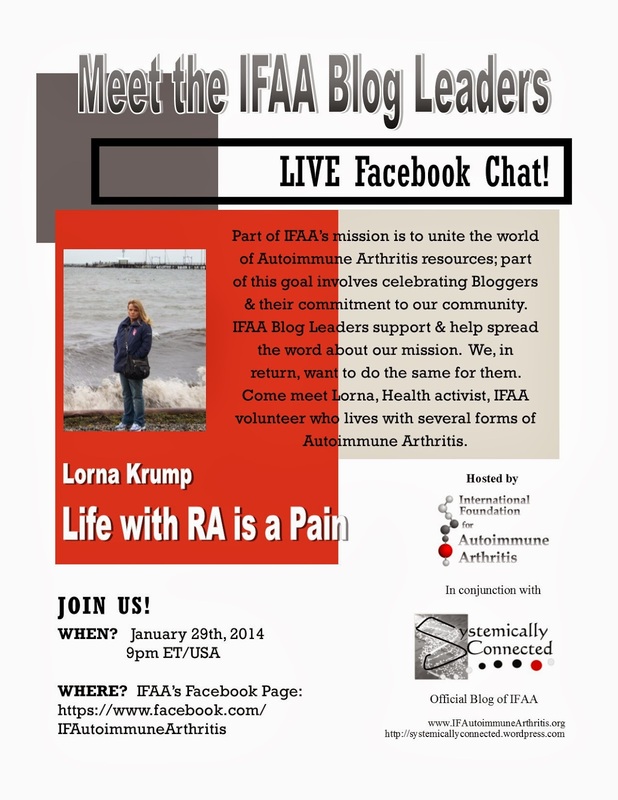 Please Come By and Meet Two More of Our Blog Leaders from IFAA's "Systemically Connected"
We have two more "live Facebook" chats this week, and both are going to be wonderful..
Lorna Krump and her blog "Life With RA is a Pain" will be on January 29th at 9 pm (ET) at the Facebook General Room for the IFAA! Lorna is just an incredible Health Activist, Blogger, & lady that lives with several different Autoimmune Arthritis Illnesses. 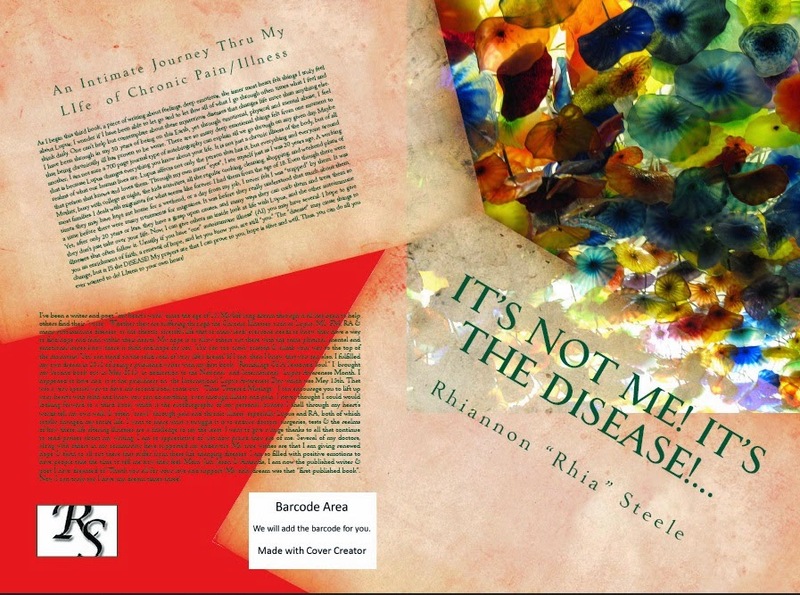 Her blog talks about life with these diseases, and so much more! I know you will really enjoy hearing Lorna! 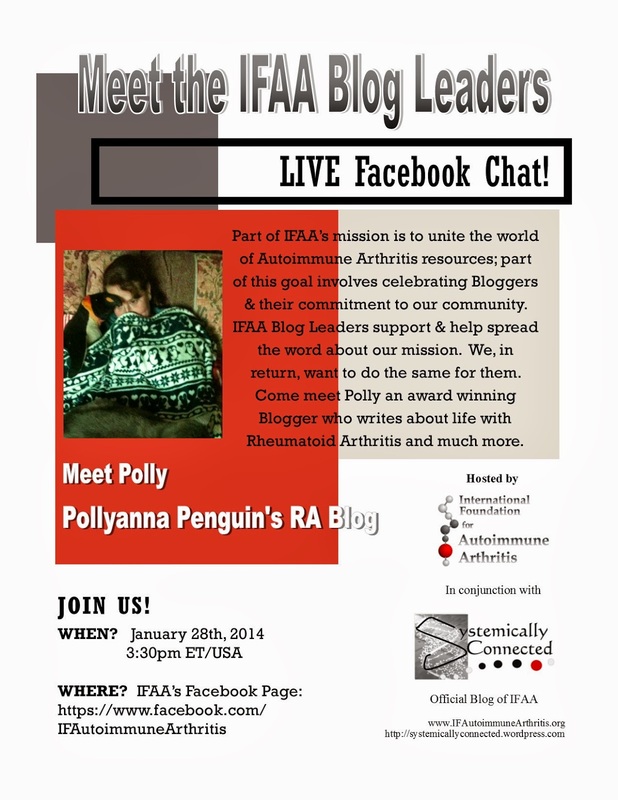 We also have Polly, "Pollyanna Penguin's RA Blog" as she tells about her life with RA, and also gives us more details on her award winning blog! Drop by on January 28th at 3:30 pm (ET) to hear her live FB Chat! WAAD14! You Just have to "be there"! May 20 and 21st! 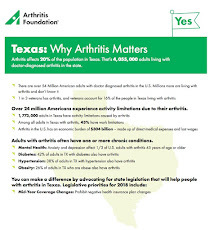 World Autoimmune Arthritis Day! May 20th and 21st 2014! Mark it on your Calendar!!!! A typical scene. You are pushing your cart through the market. You round the corner, and there stands a sweet little elderly lady, humped over, frail, and appears to be so fragile she might break. Your first thought, wow, osteoporosis. You go a few more isles over, and round the corner, to see a woman, maybe in her late 40's, possibly very early 50's at the most, standing straight, possibly "small-boned", never giving a thought to wow that woman must have "osteoporosis". Well, if you guess yes to both, then you are a winner. If you guessed the first one, you were only 50 percent right. You make walk 4 more isles, pass another elderly lady, a tad bit frail, but holding her own at around 80, and you may wonder, wow, she could also have "brittle bone disease", but no, not at all, her bones may be quite well for her age. Osteoporosis, used to be a disease, that I also would have considered an "elderly" illness. One of those that yes, after many years of age on the bones, we become less active, lose muscle mass, then bone mass, and as we get older our bones are more prone to "break". Well, if you look at my picture, would you think I have not only "osteoporosis" but, in fact mine is considered as "severe" as it gets. My bones are about the age of an 80 year old or more. The look on my face is one of longing. 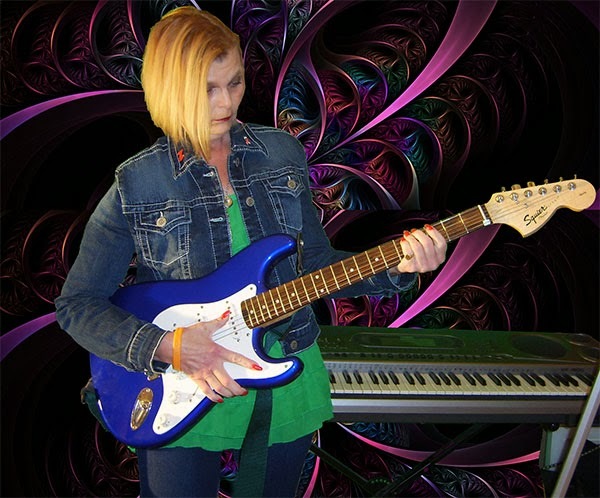 Longing to be able to pick that guitar up again and carry on with the "lessons" I had been taking, the music I had been playing, on it, as well as my drums and keyboard before this horrid chronic illnesses, such as Lupus, RA. Sjogren's, Raynaud's, Osteoporosis, and others took away my abilities by making my body either too weak in places, too stiff, too swollen, or just from the fatigue of them all, causing me to not be able to do so many of the things I loved to do. I have a great deal more to talk about as far as osteoporosis, how it affects women, especially when you begin to lose bone mass during the beginnings of menopause, how you can help your own "bones" by some preventative measures, eating properly, not smoking, daily exercise, and an active lifestyle are ways to possibly "defer" from the "bone breaking" disease. 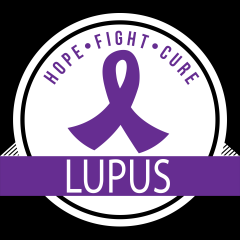 Yet, other things cannot be helped, such as having to take medications such as corticosteroids that reduce bone mass, chronic illnesses such as Lupus, Rheumatoid Arthritis, and many of the other Autoimmune Arthritic Diseases that contribute to this illness. 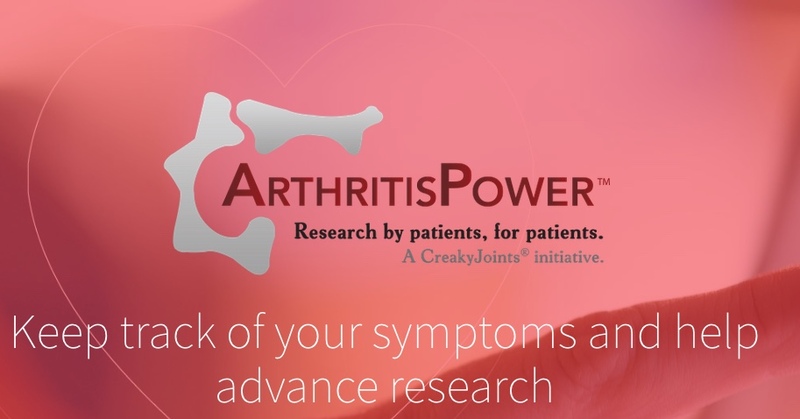 And of course always check with your physicians for more information on osteoporosis and any other of the bone related, or autoimmune arthritis diseases. I appreciate all of the well wishes and prayers... and bear with me as I shall be hopefully more up and around in about 2 or 3 days. I have huge plans for my blog, and for helping with the Systemically Connected Blog for the IFAA!!! I am so looking forward to helping Lorna! I also loved the "Blog Leaders" and all of the interviews we had last week! That was so much fun! I am getting each of you up on my "blog list" here. I have some already, and as soon as I am a bit more able to sit and think ( I am a bit still foggy from the anesthesia.... I will get everyone's listed!!! I look forward to Kirsten and I getting to meet in D.C.!!! I got my flight booked and my room booked! Now just figuring out how to take my entire closet!!!! LOL!!! Come and See Rhia "Me" This Afternoon at 5:00 pm ET - Talking about my Blog!!! "Black Box" Warning - Certain "Fluoroquinolone" Antibiotics! IF taken too close together... can certainly lead to serious issues. 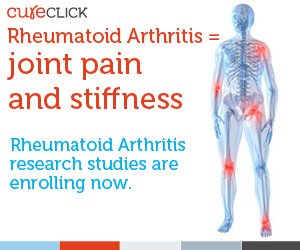 Like many of us, with or without Autoimmune Arthritic Diseases, we have the occasional "infection". Lately, it seems if you don't have the flu, then you certainly have some type of throat, lung, ear, and so forth "infection". 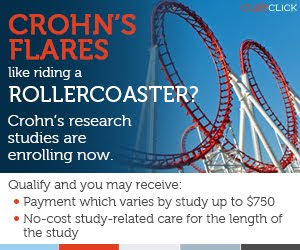 It has sent many of us to our doctors, for several reasons. Either we feel it is the flu, so we go to try and get "Tami-Flu" in time to "curb" the severity and length of having the flu. Or we stay ill so long, have fever, show signs of infections, especially lately seems like everyone has a bad cough they just can't shake. So, off we go to the doctors office. Well, like many our home has been "ill" now really since right before Christmas. My husband came down with what seemed like the flu. Yet, he did not have "all" of the what I would call normal flu symptoms, and his cough was very bad. Fortunately, I had "left over" cough meds, had Mucinex, some antibiotics that I knew he could take, bought some medicated Vicks rub, kept him AWAY from me, and I was continually spraying, wiping, cleaning... using antibacterial everything, everywhere, because I certainly did not WANT OR NEED TO COME down with any of it. It took weeks, but right about the time New Years rolled around he seemed to be feeling better, although the cough was lingering. I felt he brought had bronchitis, thus the lingering cough, etc. Well, I guess it was probably New Years Day, when all of a sudden I began to feel "stuffed up". I had just been to my doctor for a follow up visit on the 27th of December (and my Doctor was still sounding hoarse, he did already have the flu himself)... I was quite leery when I found that out. Anyway, I got the usual injection of steroid for the Lupus flare, 14 day step down dosage of predinsone, and went on my merry way. As I said above, I noticed New Years Day, I felt kind of lousy. It was surely NOT from any partying from the night before. since we were at home, with the two dogs, trying to stay awake long enough to watch the "ball drop" from Time Square. I began to notice I was feeling kind of "chilled". I did not seem to have any fever, but I was just chilled. As the day continued, I just felt worse. I began the coughing. Since I already had just seen the doctor like 4 days before, I called told them I needed some antibiotics... felt like I may have a throat or lung infection starting. So, he called me in some antibiotics, cough meds, and I picked those up and began that. This was "Levaquin", the antibiotic. I am sure any and every one of us that has an allergy to any type of "penicillin", has had Levaquin before. 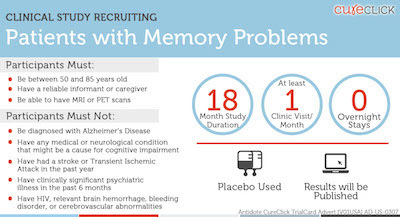 It happens to be in the fluoroquinolones family of antibiotics. 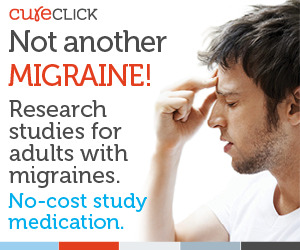 I had been prescribed it before, so I was not concerned over side effects and so forth. I picked it up and began taking it. Well after 5 days rolled around and I not only was I NOT better, but almost felt worse, I called his office again. I told his nurse, that I felt like it was "moving" into my chest. So, later in the day, I get a call back from his office. He had called me in a different antibiotic called "Avelox". I had not taken that one last "Levaquin". So, rather than do that, I left it in the bottle, and began the new one, the Avelox. I had not had this one before, to my knowledge. In fact I went to read up a bit on it, and seen it was in the same "family" as Levaquin. They were both fluoroquinolones types of antibiotics. Well, 5 more days rocked along, and in fact I had to cancel my hernia surgery, that had been scheduled for last week, on Monday 13th. I was still not well, coughing, feel lousy, my mouth broken out all in ulcers, and I knew there was NO WAY they would do surgery on me if I was still that ill. So, I called, postponed it, and then called my doctors office. I let them know this was now the 3rd round of antibiotics, I was not much better, thus where do we go from here? So, he had me come in the next day to make sure I did not have the flu, strep, etc. In fact, I even went at his request and had a chest X-ray at the hospital. So, when Jim comes home, with this piece of paper from the pharmacist, stating the pharmacist said due to my heart problems, the heart attacks and then I have a slight "extra" beat that happens, that these particular types of antibiotics are NOT ONLY supposed to be watched for someone that has NeVER had heart issues (these meds have a very slight chance of causing heart attacks or sudden death due to a QL in the heart rhythm "(QT) arrhythmia" EVEN in those who HAD NO prior heart issues. Well, at first I was upset at the pharmacist, because here I am still ill, without an antibiotic, so my husband even goes to the pharmacy to find out exactly what the problem was. In the meantime I "googled" these antibiotics. Sure enough, there is article after article.... and in the "drug" sites, drugs.com and so on... if you look any of these up it plainly states that you should NOT take these medications BACK TO BACK, without about 48 to really more like 72 hours after the one before. So, in other words, from the 1st round of Levaquin to the 2nd antibiotic Avelox, there should have been three days between them. Then that is why when this 3rd one comes in the pharmacist is wanting to find out how long it had been between the last "Avelox" and now this new one, which is the Z-Pak? At that time, since this was like Tuesday morning, I had not taken one Sunday or Monday. I did that because I figured he would call something else in; plus if this one was NOT working, why keep taking it? So, on "Tuesday" morning technically that would have been about maybe 32 hours. I actually had taken one pill about 11:00 pm Sunday night, because I knew I could NOT take one before the surgery that morning, so I took it late in the night. So, between Sunday at midnight, until Tuesday afternoon when this got called in had been 32 hours or so. So, Jim comes home, no antibiotics yet, and then the explanation as to why I could not take then until probably Thursday, which would be about 72 hours between the last one and the new one. Now that I've told you in "detail" my own predicament, this is what I find out from the pharmacist "being so adamant, and not wanting to give me that prescription until he called my doctor to get an "okay" for me to have this medication so closely together after the other two. Then there is the case that my doctor prescribed not only one, but a total of 3 of these medications without telling me that I needed to "allow" at least 48-72 hours between them and why that was so important. At first, I was "mad" at the pharmacist. He was given a prescription for antibiotics, that the doctor prescribed. So, at first my thing was "why is he again, "interfering" in what my doctor wants me to do? Secondly, why did he not just fill it, and give me paperwork (he did give Jim a printout about the warning) & put me a note on their to either call my doctor BEFORE starting this or allow 48 to 72 hours (for me more like 72 hours since I had already been on 2 of these back to back). Thirdly, why had the pharmacist NOT already called the doctor and reminded him about the "black box" warning, and that I was a patient that had had MI, & that I also had an "extra" beat, thus then he could have asked the doctor if it was okay to fill this, give the patient the information & ask her to wait until a full 72 hours were up BEFORE me beginning the "Azithromycin"? On the other side of the "tracks" so to speak... WHY did my doctor NOT warn me about this, and let me know I needed to wait 48 to 72 hours BEFORE the very first antibiotic, which was the Levaquin, and then the 2nd medication, the Avelox, (moxifloxican)? In fact the doctor had me come in and see him, between the 2nd and 3rd antibiotics. Since I was still ill, and seemed to have an infection that was not wanting to go away, I have to wonder again why he did not get "red flags" all over my "electronic chart" about the black box warnings and taking this group of medications too closely together, without any waiting time in between? Plus and I am still researching this one, usually "Avelox" is given AFTER every other antibiotic has NOT worked. From what I read in one place, it is the strongest before having to go into the hospital for IV antibiotics. So, here we have TWO situations. One, my pharmacist is doing his job basically, and erring on the side of caution. Even though it means more or less going over the doctors head, he was very concerned about all of this for two reasons. First of all, these medications, fluoroquinolones, carry this warning for EVERYONE. Whether you have had a heart attack, or heart problems in the past, OR even if you have NEVER had any type of heart problems, allowing no "rest" time between them can cause heart problems anyway. Now it is a minute chance, but it is a fact that is concerning enough to have a warning on it. So, doctors should have caught that right away. Then he could have informed me of the issues, I could have just picked up the script, waited until Thursday and began the medication. Also, it should have been NOTED with a "FLAG", in my chart, that if I have to have any of these back to back, to make sure I am told to leave 48-72 hours between them. No harm, "no foul"... as far as I would have been concerned. That would have stopped the "buck" right there. Then if the pharmacist questioned it, I would have been able to tell him I do know about the warnings, and I not going to take these as instructed by my physician as far as the waiting period. So, WHY did my DOCTOR, who has been seeing me since about the first day he opened his practice here NOT catch this warning? Why was it NOT flagged in my chart? I realize it was probably the first time it took 3 rounds of antibiotics to get over the chest infection, sinus whatever, but if that "warning" had been in place, even I could have asked him about "waiting" the time between them. Now, WHY did the pharmacist NOT JUST CALL my DOCTOR"S office and inquire about this? If he was "flagged" at the very first of trying to fill it, why go any further without calling my doctor? That also would have caused a great deal less "stress" on all parties involved. Especially myself, the patient. Even AFTER we asked the pharmacist to call the doctor, and he did call him; BUT after telling my doctor about the issue, my doctors tells him to "keep me on" the Avelox! Well, that was fine and dandy, BUT I only had ONE PILL LEFT! I was prescribed 7 days worth and had taken 6. I was told NOT to take the last pill by my doctor, and start the new one instead. So, now the doctor NOR the pharmacist take into consideration there is no "refill" on this, and basically i am OUT of them. I call to find out what was happening (now Jim had spoken with the pharmacist very EARLY that Morning and he promised he was getting on it right away)... so when I call that AFTERNOON fairly late at that to the pharmacy; for one I thought no one would ever answer, and 2 after I FINALLY talked with one of the assistants in the pharmacy, come to find out the pharmacist had NOT EVEN CALLED the doctor YET!!!! Here I am ON HOLD for at least 15 MINUTES while the pharmacist is then calling the doctor!!!!! Of course, finding out that NOTHING, absolutely NOTHING had been done to resolve this was just fuel on the fire! I'm now stuck, still ill, and still needing antibiotics, BUT the very people that could resolve this did nothing. Finally, my husband gets on the phone with the pharmacist. He asks him about the prescription for the "Z-Pak" or Azithromycin, if it can be filled? Well of course it can be filled. It was send to BE FILLED! So, I told him to ask the pharmacist to fill it, we would not pick it up until the following day (which was Wednesday) & I would NOT take any of it until Thursday. Problem Solved! I do not take these too close together, I still get the antibiotics. So, that is exactly what happens. The scripts are all picked up Wednesday afternoon. Thursday morning arrives, I take my medications, the antibiotic, and all is safe on the home front. Now WHY did ALL of that DRAMA have to play out over a PRESCRIPTION? Everywhere "other than Jim and I" there was a communication breakdown. It was apparent that the pharmacist never "thought" to call the doctor until we suggested it. Then it was more apparent that neither of them gave thought to the fact I only had ONE pill left of the middle one, the AVELOX. Moreover, WHY did my doctor NOT KNOW or do anything if there was THAT TYPE OF WARNING?!! ON these medications? I was already curious to know why an "antibiotic" would have these types of "side effects"? It just did not seem "logical". I guess my thought to antibiotics is that either you have an "allergic reaction" to them, or they just rip your stomach up and make you nauseated, and then they need to be used cautiously due to these viral bugs out there now that can "go around" the antibiotics and truly cause you to build up a "resistance", thus they need to be used wisely and cautiously. Now I DIDI KNOW about the potential for the "achilles" tear or rupture, I had read that. Plus of course some of the other side effects from most any type of antibiotic... stomach upset, and of course any type of allergic reaction. Now that your head is spinning and you feel overwhelmed with information, I just wanted all of you to know this. 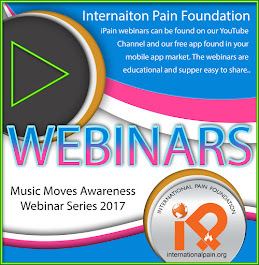 I realize MANY of us, especially with Autoimmune Arthritic and/or other Autoimmune Illnesses are "prone" to having infections. Doctors usually treat us with more aggressive treatments due to the fact as my doctor told me last week, we can go from up and having a bit a lung infection, throat etc... to ICU and extremely ill within hours due to our immune system! So doctors are caught in a quandary, as to what to do. I don't blame them, as far as being in this place of do you "err" on the side of giving the antibiotics, especially with a patient, that is "immune compromised", possibly like myself, they cannot take "penicillin" based medications because in one way or the other we are allergic to them. Yet, when you have someone who has already gone through one round of medication, and they are not much better, if at all, you have to move onto something else, stronger, different and so forth. Well, now the problems lie. If you have a "healthy"(I mean as in heart healthy) patient, with no prior MI's, arrhythmia's, & knowing there is a definite "warning" that these types of fluoroquinolone antibiotics in studies have shown to have a very, very minute chance of causing issues, then as most doctors probably would, they prefer to give the antibiotic for the 7 days, because the other might mean a patient in ICU, much more ill, due to not getting the meds immediately. Then of course, and I knew about the "tendon" tears. I had read that several years back I believe about Levaquin. 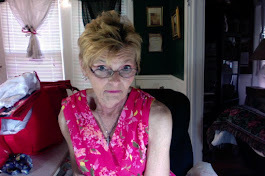 I had been given Levaquin due to all of my knee replacements and surgeries where there is a higher risk of infection. Thus it was one that was used on me; it needed to be, so I was "informed", and took the antibiotics, without giving it much thought from there. At that time this "other" warning about the heart problems has not come to light as far as a "black box warning". As I was "re-reading" over parts of these sites this morning, making sure I gave links where the information was, and to make sure you, the patients that may come in contact with these types of antibiotics have what you need in order to either research more, and/or ask your doctor if you are put on any of these types of medications. Whether "heart issues" or not, you may feel you want the entire picture before jumping into the lake, in other words. I am not sure WHY I tend to RUN INTO the strangest issues medically!? It seems if something odd, unusual, rare, and whatever else you want to call it, you can bet I've either been through it, or have a good grasp upon what is happening when someone mentions certain events they come in contact with. WITH ANY medication, ESPECIALLY something NEW to YOU..
Don't RELY on the Doctor, Pharmacist, or health professional to give you "accurate" information. IF you SEE something that is ODD, or something you "feel" could be harmful to you whether the meds itself, or maybe it might not "mix well" with some other medication you take, then question iT! My hope is this helps others to be able to deal with these issues, if they come up, and have their own "ducks" all in a row. You can Endorse your favorite WEGO Health Activist Daily! I did not realize you can still go into WEGO Health Activists Awards and "ENDORSE" DAILY those that have been chose as "NOMINEES!!!! 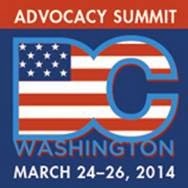 I was not aware of it until early this morning, so I did want to let everyone know you still have a "voice" in the 14 categories of awards to give your favorite Health Advocates a "Thumbs Up"!!!!! Now, of course I would LOVE YOUR "Endorsement" for "Best in Show - Blog", but I wanted all the Nominee's to have a chance to be endorsed! IFAA Blog Leader "Rhia Steele" & Her Featured Interview - I Would LOVE to See you there! I am so totally amazed and thrilled at the turnout "WE", meaning IFAA has had on introducing all of our Blog Leaders with Interviews over the past couple of weeks! 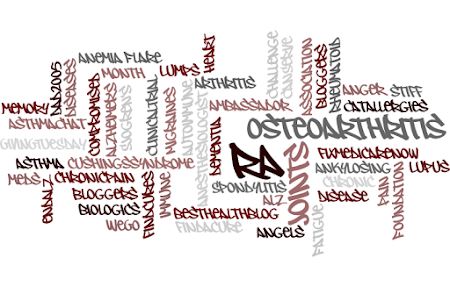 We still have many more to do, and my hopes are is that you will stop in, say hello, learn some wonderful things about these ladies, their own personal stories, and how they began blogging for "Autoimmune Arthritis Illnesses" of one kind or another! I have learned a great deal about these illnesses, along with the wonderful bloggers themselves. 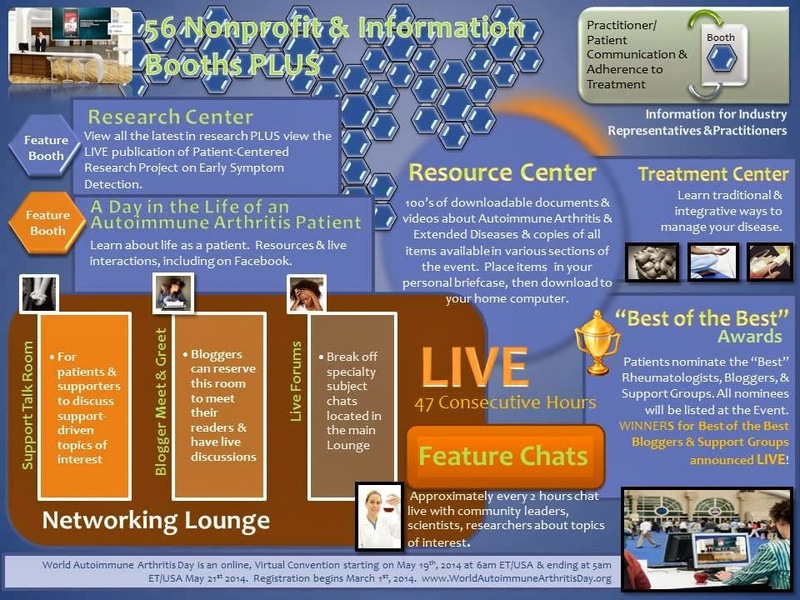 They come from all over the nation, all walks of life, some even "caretakers" for their own children; yet one thing in common, these women blog to help get Autoimmune Arthritic Illnesses information out there, so we can do more research, find educate and aggressive physicians quickly, who know and understand these life altering illnesses. 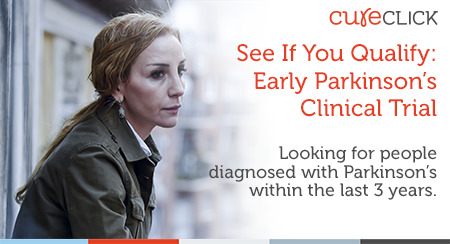 We are wanting to CHANGE that on the average of 4.7 YEARS before many get properly diagnosed! So, I hope you shall stop by on the (19th, which is the coming Sunday) - this maybe on Monday evening but I will give you a definite day (Whether Sunday or Monday) later in the week! Introducing! 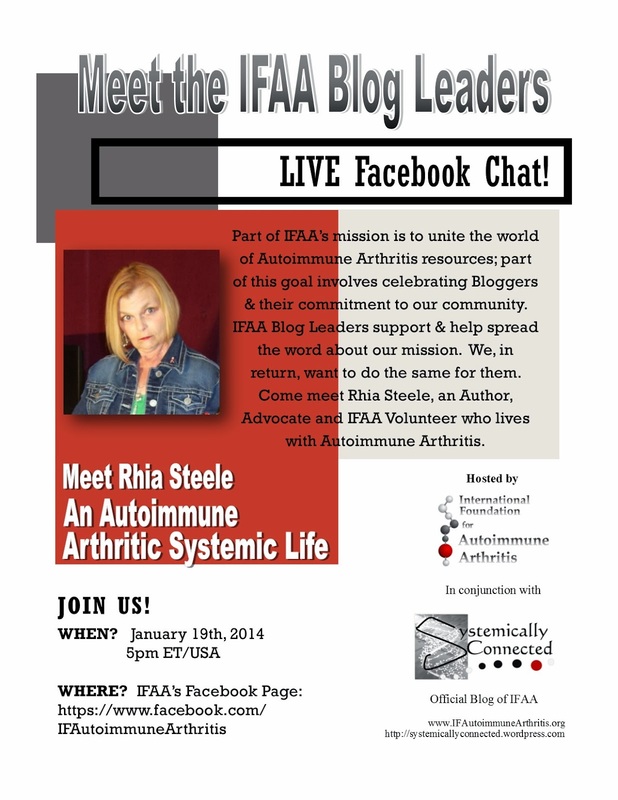 - "Systemically Connected" the Official Blog for the International Foundation for Autoimmune Arthritis' Blog Leader - Rhia Steele!!!! Now if she looks "familiar" (which I hope so) I do so hope you will drop by IFAA's Facebook page and say Hello! 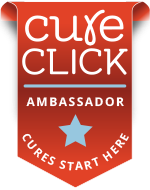 I am more than honored to be a Blog Leader and an Active Volunteer for the International Foundation for Autoimmune Arthritis! Plus I am even more honored to be a "Guest" Blogger on the 19th! 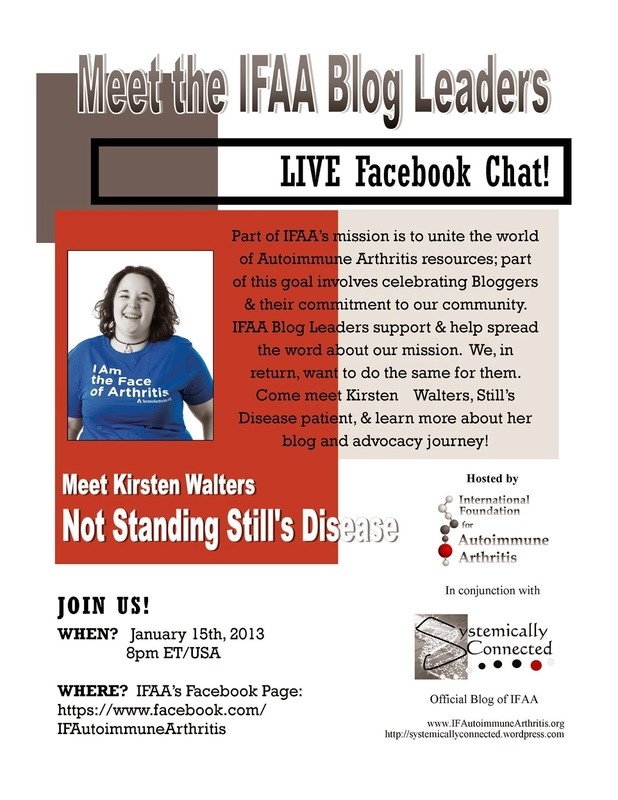 Please Come and Meet Our Next Guest Blogger - Kirsten Walters as she talks about her Blog "Not Standing Still's Disease"
Here is the link for the FB page for IFAA! ... for me it is worth mentioning. I became a HUGE" Matchbox 20 “ fan when I was living in Seattle. I had bought their first two CD’s(and yes then CD’s were still a huge market) LOL! Both of them really had some songs on their that “not only touched me back then” BUT it was as if every word they had written, sang, and played music to spoke to this very inner core of my being. I recall walking on Alki (West Seattle looking over the Sound back to the City) Beach, and I played those two CD’s and could walk for hours. There is something un EVERY song, that Rod Thomas sings that just expresses (even now and especially back then) in which sounded like many of my poems and short prose. My live at that time was such an incredibly wondrous, almost esoteric tempo to it, thus something about most of those lyrics, just reached out and “grabbed” me. Anyone that is a Matchbox Twenty fan, knows the song, “Unwell”. It seemed to be the “theme” of my life at that time! Now, I’m not saying “illness” as far as being physically sick, I really was not “mentally” or “emotionally” challenged either. Yet, for some of those looking outside to within me, may have thought to themselves, she seems a little “Unwell”! The fact was those years in Seattle, especially the last three, were the years that taught me SO MUCH in regards to my strength in all ways, my courage to venture out, to a HUGE city, thousands of miles from any family, or anyone I really “knew” that well; in more ways than I can count, I felt each day, I was “Less” “UNWELL”. Not only all of the above, but I rented my own apartment all by myself (may sound silly to some but for me it was a first; I bought my “own” first “very good” used Honda & knew without any help I could pay my car payment, living expenses, and so on all by myself. I “gained” an independence in my those years more than any other in a lifetime! I interviewed all through the downtown part of the city (LOL! anyone who knows Seattle, knows it has some HUGE hills to go up and down in with very busy city traffic), and in fact had taken two previous jobs I had loved being an apartment manager at both! This new one was at a banking institute and at that time it was MEGA busy due to ALL the interest rates, and the “Fannie May” and all of that boon at that time. I got hired on to help be the assistant to the lady that did all of the last paperwork for home loans. I had to know everything from what a Title Policy needed and looked for, the note, the deed of trust, insurance, flood insurance, all of the truth in lending information….. I was responsible for making sure we had ALL of that paperwork and it was correct before they could “close” on the home loan. We also “sold” off “blocks” of them. Of course that was to have more funds that would ultimately turn into more blocks of loans that were sold off also. You get the picture. My salary was MORE money that I had ever made at any job in my life! Now even though was was a fact, I still had those rent, car and living expenses to think about. But I had figured all of that out and knew I would be fine. :) I got insurance coverage, I kind of worked my “own” hours. I was a morning person. So, I would come in at 7 am, way before any of the rest of them showed up. My direct boss, bless her heart had a young son, she was single, or about to be, and she usually showed up about 9:45 or so. LOL!! That mattered not, because as soon as 8 hours rolled around, I could leave. So, I went home early most days also. )BY THE WAY this is PRE AUTOIMMUNE ILLNESSES DIAGNOSIS) days… I did suffer from severe migraines, did all my life, and they put me down at least 2 days when I had one. Anyway, dream life for me… not rich by no means at all. But, I saved a bit here and there and would buy a new outfit, or treat myself to something like a little TV I bought for my apartment back then, etc. Anyway, I am sure many people that “knew” me then, often wondered if I didn’t have a “screw or two loose”, or was missing a few cards from the deck, a brick or two out of the wall etc… because I was “eccentric”. I “danced” life to my own tunes playing in my head. I wrote more poetry and short prose there than ever. I didn’t have “friends” per se, other than some online that we had known one another for a long time. I dressed as I wanted (at that time I only weighed like 118 pounds and had a waistline that was tiny like Dolly Parton’s… BUT not the “TOP” of the hour glass like she did” HAHAHA! !… I loved clothes and shoes… yet with it just me, and my bills, I bargain hunted on the weekends at the Mall nearby, and bought one thing etc… as I could afford it. Yet, even though I felt “business” dressed, and I was… I honestly believe the supervisor OVER my own supervisor was quite jealous! Never did figure that one out… the ONLY thing I DID figure out is that she was a “backstabbing, manipulating, ladder climbing, crush the persons under you, and a plain “witch” of a boss and a woman. Okay, now to pull all of this “insanity” together… Hey good word for this “insanity” …….LOL!!! That song by Rob Thomas” “ Unwell” was the theme of my life… I even would quote some of it at times when it was appropriate, “Oh, no, I not crazy, I’m just a little “Unwell”… and if you stay you will see a different side of me”. I still “dance to my own “weird” tune inside my head”…. I am NOT one to “go along” with the crowds, and I REFUSE to HURT< BACKSTAB, MANIPULATE …. and all of those other “nasty words” to ANYONE! I am NOT a Ladder climber! And if I did NOT get the “promotion” or raise for some reason, as far as I was concerned, then I needed to do a “better” job… and those things like more money, a further up position, more responsibility… all would come in good time. I remain the same. I will “take up” for the guy or gal being stomped on, I think that is why I just about HATE politics, I am NOT a “used car sale man” (even hough I did do that for a few months in my twenties), … you get the picture… if MY OWN SKILLS, personality, aura, …. does not put me in that place, then I need to “turn my sails” a different direction and get with the winds of change that shall make my sail into my own smooth river happen. There are so many days, that I say just this… I’m not Crazy, I’m just a little Unwell, and if you will stay long enough, you shall see a different side of me…. and it is very true… even here in Facebook, a few of those who have gotten to really “know” ME, not just the illnesses me, etc… but this complex, but simple, conundrum, and dichotomy that makes up the wholeness that I am… of course the “autoimmune illnesses” and age have “changed” me in many ways… yet that creative, tend to flow on a different rivers path “me” is still very much alive and “Well”!!!! “She” does not show up as much as far as to others outside my very personal life very much, yet, if you “stay” a while… you shall see that “different side” of me… … And to “honor” that song… Here are the lyrics… and they just tell a story that was a piece of my lifetime…. "More Than You Think You Are CD"
DREAMS DO COME TRUE!!! Even for the weary and broken hearted!!! This is HUGE NEWS!!!!! I will give more details tomorrow when I am still SHOCKED, BUT a bit back down to "Earth"!!!!! I have to say, and I do not want at all to sound conceited, BUT HONESTLY I am PROUD of myself, and I feel I truly deserve this opportunity to SPEAK OUT for ALL of us suffering from these diseases!!! Diseases that more often than NOT RUIN Our Quality of Life!!! Believe me, if the Lord does let me get there, every thing I do and say will represent ALL of US!!!!!! 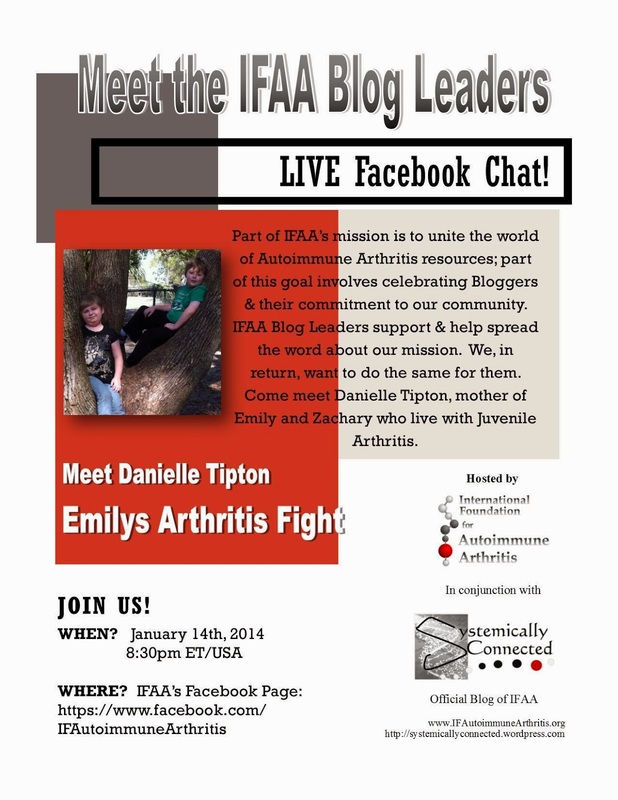 IFAA is Pleased to Announce A 2nd "Blog Leader" Danielle Tipton in an Online "Chat"!! 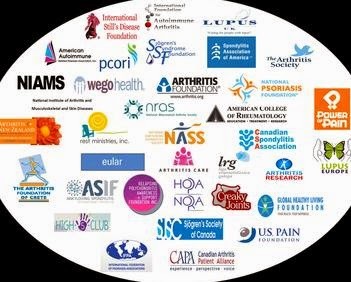 International Foundation of Autoimmune Arthritis Diseases represents YOU, I, and EVERYONE that are plagued with these horrid, still a great deal misunderstood. I am so pleased to "introduce one of our next "Blog Leaders", Danielle Tipton! 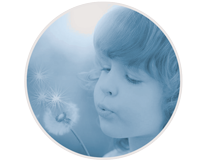 Being the Mother of two children that suffer from Juvenile Arthritis! As she blogs about Zachary and Emily, you shall get a small glimpse of how difficult it must be to have ONE child with this disease!!! I just cannot fathom how she does it all with two chronic ill kids. Her fight is an extremely personal one, I would say. So, please join as she tells her "caretaker" and Mom's story, on January 14th, 2014 at 8:30 pm (ET). Please support this critically important disease. 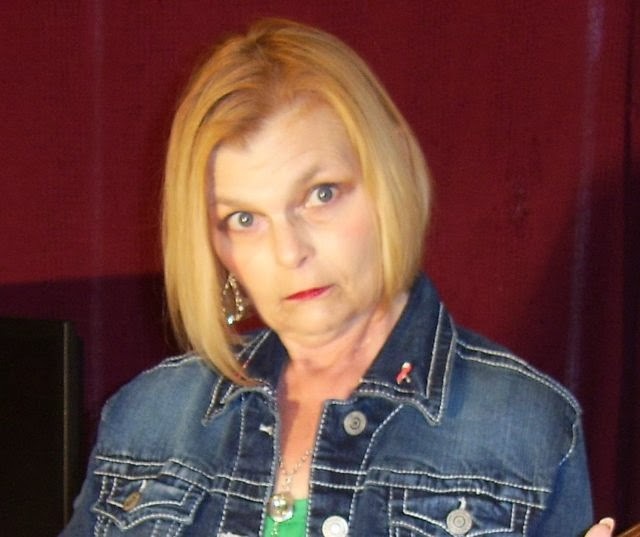 As a woman "survivor" of not just one heart attack at 40 years old, but a 2ns one at 50 years old, I have first hand knowledge about just how differently MI's and their symptoms maybe for women. I had NO crushing chest pain, or pain running down my left arm. I was actually a healthy eater, an avid exerciser, walked daily 5 miles plus, did not consume much alcohol, and I was at a "normal" almost a bit too underweight at the time. My symptoms were very little. My ankles and feet began to start swelling on me, especially if I sat down at my computer for a bit. I thought not much about it, but I did notice that they continued to do that throughout the weeks before. Other than that, I had been having some "chest discomfort" for about 3 days off and on. I mean something like well, indigestion, and not really even that bad. Yet, no jaw pain, no arms pain, no other "real" symptoms that would have clued me in for what would happen on January 8th, 2001. As I said, I had been having this "pain" off and on, and thought maybe I had a case of bronchitis. So, I rang my physician to tell him a bit, including the strange thing about swollen ankles and so forth. I had been on the phone with his receptionist explaining what had been happening, and she had me hold just a moment. I thought oh boy, they want me to come in. Nevertheless, she came back quickly, and said your doctor wants to you to get to the nearest ER now, and if you are having breathing issues, etc. call 911! Lord, I still thought this sure is a lot of trouble for a bit of pain in my chest. In fact I had almost decided NOT TO GO at ALL! If it were not for a dear friend of mine who lives in Malta.... "screaming" at me online telling me IF I did NOT go, she was going to find an ambulance to pick me up. So, I agree. I throw some clothes on. I was totally alone (another story for another time)... and no one to drive me 20 PLUS miles to the nearest hospital. And I was out in the country enough, by the time someone came to get me, I could just drive myself. So, I grabbed my purse, keys, and cell phone, got in the car, & started to the ER, which was about 20 miles away. At one time I thought to myself "MMM.. maybe I should turn on the flashers" on. Needless to say, I began to be a bit frightened when the thought crossed my mind "What if I pass out?" Just when you need one, not one police officer in sight! So, I went through the "back way" of the town the hospital was in, and missed red lights and traffic as best I could. I pulled up, parked, got and out and walked myself in, and calmly told the receptionist my doctor asked me to come straight to the ER, he thought I might be having a heart attack. Well, all heck broke loose! I guess my doctor may have called ahead, because they were escorting me back very quickly, right to a room, and right with IV's, EKG, Oxygen and the entire ordeal before I was even able to say much of anything. I realized when one of the doctors that I happened to know (I was a Patient REP at that hospital before this happened), when he came in after about 10 minutes or so to speak with me, he basically told me that if I had NOT gotten up, and drove myself there, the situation would not be nearly as great (even though it was not great at that moment) if I had waited even another 45 minutes. I was having a "massive" MI, from what all of the labs were telling them. There was already "clot busting" meds going into the IV, they actually even gave me an aspirin, and all kinds of things were beeping and going on around me. He told me that when I was "stable" enough, hopefully the next day, they would move me from the ICU unit their to Dallas at Baylor. Well, of course I was totally terrified!!! At the time I had NO ONE there! My parents lived in the next town up towards Dallas, but by the time someone called them, and they drove about 25 - 30 miles there, it took a bit. They gave me meds, pain meds, and IV's , etc... all night long, with the telemetry on watching me. So, the next morning, I took that HORRIBLE ambulance ride to Dallas! NEVER if you can AVOID it HAVE TO RIDE in an AMBULANCE! From there I spent about 7 days, lots of labs, cardiac tests, they did an angiogram, and the old fateful "treadmill" test... of course they could not put me on the walker, and just gave me medication to up my heart rate instead. I was totally fortunate through out it all. When ALL of the tests, work ups, labs, plus the other 100 things they did were finished, it was then known the YES the heart attack was SEVeR, BUT due to ME getting at the ER when I did, the clot busting meds, STOPPED most of the damage to the heart muscle. :):):) I did not have to have a stent at the time, had some issues with the artery above my heart going into spasms, gave me meds, sent me home, and told me to walk, eat right and call the doctor if anything else came up. :):) Talk about a miracle! This is THE time, I honestly DID see myself.... as I was laying in the ER on the gurney, when my first doctor came in, I was "watching" myself from above... It was the oddest, surreal, but most amazing feeling I ever had. IT maybe not that was for some, and some say they see the white lights and so forth... I just knew either my own mind kind of "detached" for a few moments, and then I could kind of look down objectively upon the situation. So, I could go on BUT I stop there... (by the way my 2nd MI took place in 2010, only about a week or two from the date of the 1st first, just 10 years later. I had already been extremely ill, and in the 2 hospitals, and I was so totally weak, I think my heart, was so almost "broken" I feared going home. I still even after 6 weeks, was terrified of leaving the hospital. Thus the day before they were thinking of sending me home, I truly was so totally out of it, the terrible fear and stress I was in, they feel caused the 2nd one!!! So, "Go For Red" It Could Just Save Your Life!!! Come to IFAA & Meet Our Bloggers for a Live Chat!